Earth Whispering - Van life in Europe. How easy is it to van it in Spain and Portugal? Where can you park? How much does it cost? What about buying diesel? Where can you empty your toilet and fill up with water? These were all questions I was asking before I set off. I've now been on the road nearly three months. So here's the low-down on vanning it in Spain and Portugal. I'm from Turkey, so let's just say my approach to rules is 'relaxed'. 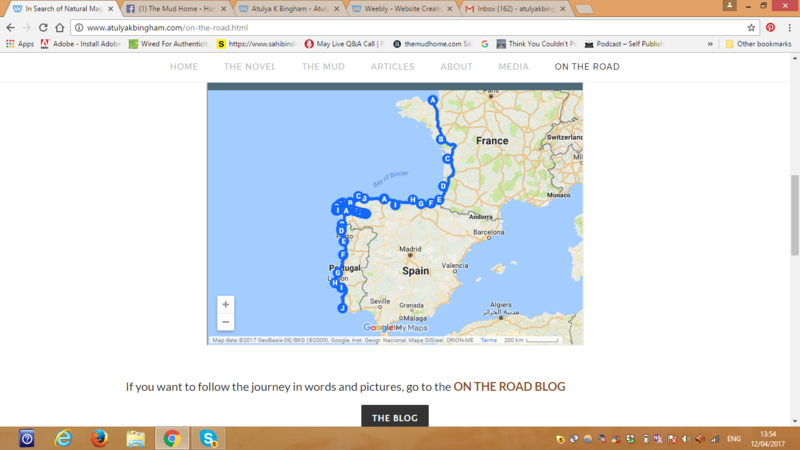 Nevertheless, having just spent two months in the UK, land of the Job's Worth* and the height restriction barrier, when I first cruised into Spain I was nervous about camping wild. Would some interfering busybody complain? Would the council turf me off? Would I be harassed? Or fined? Police? Weirdos? After almost three months on the road in Spain and Portugal, I can tell you now: You can park pretty much anywhere as long as you're not obstructing a gate, or attempting to camp on the hard shoulder of a bypass. I've camped in national parks, in municipal car parks, at roadsides, and on lots and lots of beach fronts. No one has ever bothered me. Not once. It's live and let live on the Iberian Peninsula, and hallelujah for that. Church car parks can be exceptionally convenient as they usually have a tap in the garden as well (shh). Avoid them on a Saturday night though, or you'll wake, as I did one rainy Sunday morning, to find an entire church congregation clucking round your van wondering who the strange foreigner is. Caveat: I've not tried this in high season. I would imagine it gets harder as the tourist season kicks in. 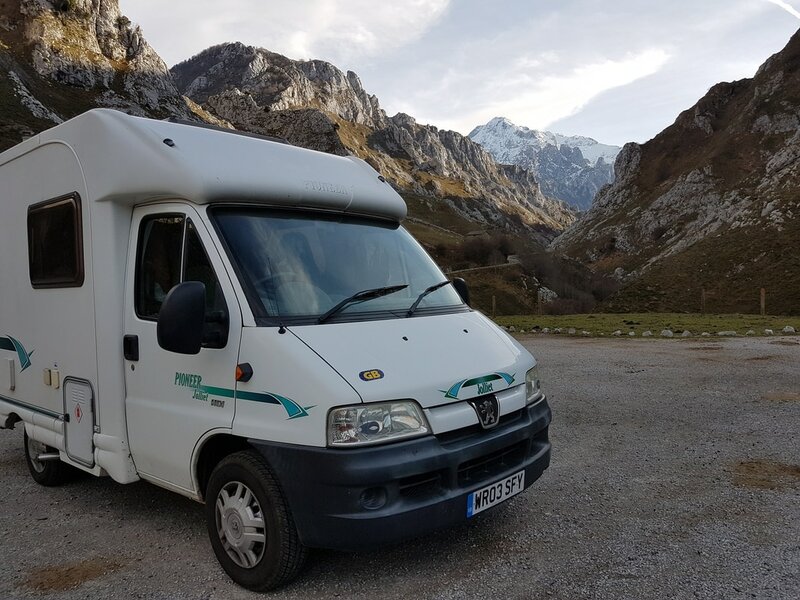 How much does the van life cost in Spain and Portugal? This depends on how much you drive, how much you eat out, and whether you use campsites (I rarely do). Having made a cash flow table for the past three months, I see I'm spending on average between 700 (Northern Spain) and 750 (Portugal) Euros a month. 200-250 Euros of that is going into my fuel tank, because I'm moving a lot. At the time of writing, Portugal is more expensive for diesel than Spain, hence the increased spending there. I eat out about twice a week, but have coffee and cakes in a cafe every day. Most cafes in Spain and Portugal offer free wifi. Southern Portugal is way more expensive than the rest of the country, so if you're spending the majority of your time there, you'll probably rip through more cash. I didn't drive to the south of Spain this time, so I can't comment on that, but assume it's the same story. 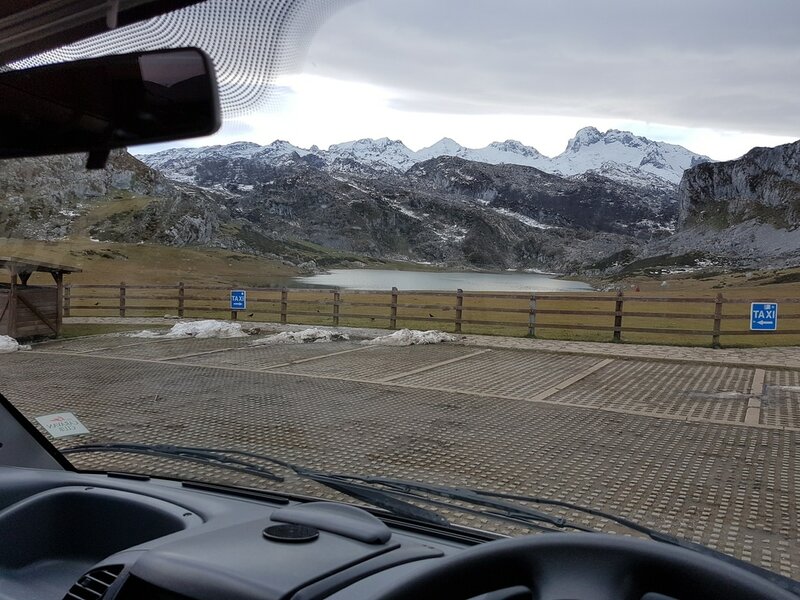 Park where you want in northern Spain and Portugal. Despite the ever-extending claws of global capitalism, a refreshing touch of socialism survives in much of Europe. I have been amazed to see many free caravan service stations en route, particularly in Spain. When you spot the lovely little blue sign with the caravan on it, know you can empty your waste, fill up your water tank, and overnight, all for free. Yup. For free. These are really cheap, so look out for them. 6-10 Euro (low season) and 10 - 18 Euro high season, with use of showers, electricity, water and internet etc. included. They also tend to be the ones open in winter. If you've got a diesel motor (and probably you have if you run a van) you want the black pump (Gaseleo). As mentioned earlier, Portugal is more expensive than Spain for diesel. In northern Spain, there is water everywhere. The municipalities seem to have installed public taps all over the place. In Portugal most villages have a central tap or wellspring that you can fill up from, though the further south you drive, the drier it gets and the more difficult to find water. I noticed many springs in Algarve and Alentejo regions drying out even in early April. If all else fails there's always petrol stations. Have you vanned through the Iberian Peninsula? If so, do add your own experience in the comments below. Author of Mud Ball and Ayse's Trail. Natural Builder. earthbag, earth plaster and limecrete expert. 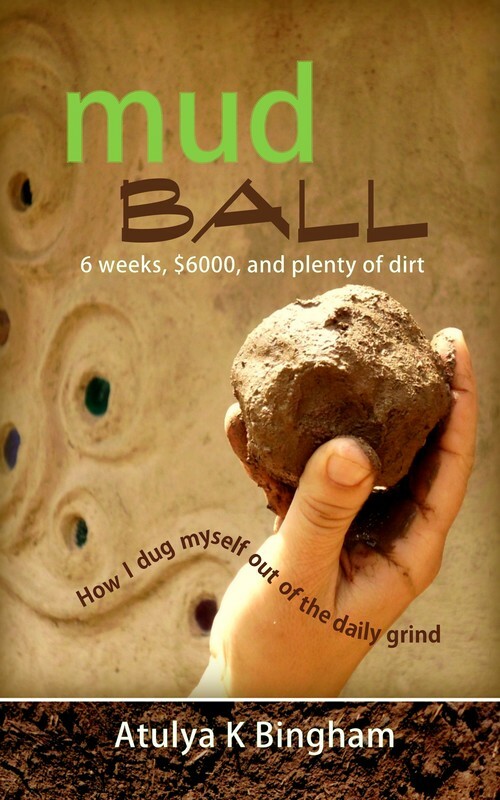 How I dug myself out of the daily grind. "If you've ever fantasized about going off-grid...this book is a must read." Map of where I've been. Follow the journey, and see the photos.